We had at dinner M. de Bernhold and the Baron d'Andlau, who made us laugh a great deal at an account which he gave us of a visit that he paid to Madame de Helvetius. 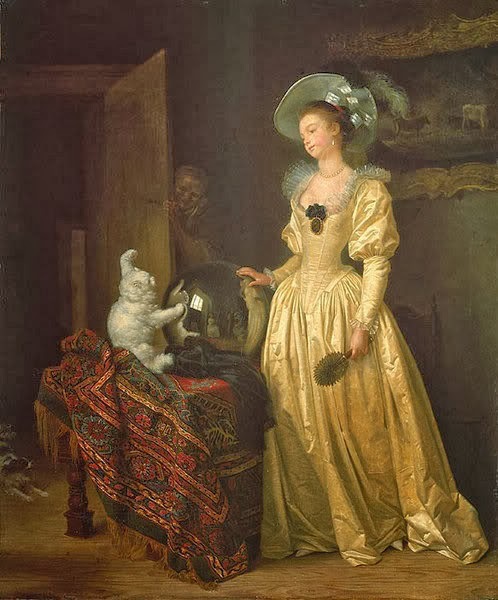 This lady lives in a splendidly furnished house at Auteuil, where her chief occupation is attending to the wants of several beautiful Angora cats, which she has collected. As M. d'Andlau and a friend, by whom he was accompanied, entered her drawing-room, they were at first attracted by the unusual beauty of the decorations of the apartment, and next by its strange occupants. Madame Helvetius received them very politely, but in rather a singular manner, dividing her discourse between them and her favourites. I must give her own words, as M. d'Andlau repeated them to us. “ Gentlemen, I am very happy to see you"
- "What are you doing there, Courtois? You are annoying Marquise ; come off that chair ! "Charmed, monsieur, to make your acquaintance"
- “Well, this is very bad, Aza is sick, and took medicine this morning." " You are a fool'' (this to a servant) " Gentlemen, what lovely weather this is !" - "Not there,stupid ; don't you see that Musette and her kittens will spring at you ?" All this time the baron and his friend are standing in the centre of the room, not seeing where they could take a seat, all being occupied by the feline companions of the lady of the house. These animals were all dressed in long robes of different colours, lined with fur, to preserve them from the cold ; but however much this attire may have added to their comfort in one way, it considerably decreased it in another, for the poor creatures could not move with the freedom or ease that was natural to them. Some of them got off the chairs, and walked about with great dignity, giving the visitors an opportunity of admiring their flowing robes of embroidered satin. M. d'Andlau did not know how he would be able to restrain his merriment at this sight, when fortunately his attention was attracted by the door opening, and a servant bringing in a tray, on which were were several dishes of delicate meats, such as wild-fowl, chicken. These were divided between the cats, and there was the most terrible uproar and confusion until each was satisfied.
" I did not know where to sit," said M. d'Andlau, " for these fantastic-looking gentlemen spared nothing, greasing all the beautifully-covered chairs, and I was afraid that I might take my leave with the wing of a fowl hanging to my coat'"
We were greatly amused by this story, and not we alone, for M. d'Andlau told it all through Paris. It was the cats, however, who provided the pretext for an amusing skit by the abbé Morellet, enclosed in a letter to Franklin dating from 1786, shortly after Franklin's return to America. The letter itself is a poignant evocation of cosy domesticity, penned as it was so close to the brink of Revolution. Morellet had a reputation for biting wit - Voltaire could not resist dubbing him abbé "Mords-les", (ie."Bite-'em!") - but there is none of that here. Morellet sends his good wishes for the fledging American Republic, not, he says naively, as Franklin's friend but as a "cosmopolitan". He is pleased that there is on the face of the Earth a country where the government is truly concerned with men's happiness, where property, liberty, security, tolerance are natural goods like the earth and climate. At Auteuil, he reports, Madame is drinking too much coffee, against Cabanis's advice and, of course, constantly taking Morellet's portion of cream. The bull-dog that Franklin's grandson brought from England is badly behaved and has bitten the abbé de La Roche. The overfed cats meanwhile demonstrate the validity of Franklin's thesis in On peopling countries that population increases with the means of subsistence, for they are multiplying rapidly in the wood store and the backyard. They number eighteen and rising and do nothing to keep the mice down. Apparently there is talk of drowning the excess moggies, though perhaps they may instead be usefully exported to America to contend with the New World squirrels and rats. His essay takes the form of a mock legal plea by the cats against this proposed execution without trial. An English version was included by William Temple Franklin among Franklin's collected works. Morellet was well qualified to present the cat's case, since it was he who in 1765 had translated into French that cornerstone of Enlightenment penal theory, Beccaria's On crime and punishment. It is hard to believe the threat of death was ever serious, but we can safely assume the cats were acquitted! AN HUMBLE PETITION, PRESENTED TO MADAME HELVETIUS, BY HER CATS. A TERRIBLE piece of news has just reached us to interrupt the happiness we enjoyed in your poultry-yard and wood-yard. We learn, that in consequence of certain calumnious representations on the part of our enemies your Abbés, a sentence of proscription has been issued against us, and that by means of a diabolical invention, we are all to be seized, put into a cask, rolled down to the river, and abandoned to the mercy of the waters. At the moment in which we are drawing up this our humble request, we hear the strokes of the hammer and hatchet from the hands of your coachman, who is employed to frame the instrument of our destruction. They evoke Madame's indulgence to other creatures - a nice sketch of the extent of her bird-feeding activities! But, most illustrious lady, shall we be condemned without being heard? and shall we be the only creatures among so many fed and nourished by you, who do not find your bosom alive to justice and compassion? We see your beneficent hand every day feeding two or three hundred chickens, as many canary-birds, pigeons without number, all the sparrows of the neighborhood, all the blackbirds of the Wood of Boulogne - nay, even the very dogs of your domain ; and shall we alone not only cease to experience the effects of your beneficence, but, what is more terrible to think of, become the objects of a cruelty wholly foreign to your nature, and never exercised but towards us. No, the natural goodness of your heart will recall in you sentiments more worthy of your catology. Alas ! what are the crimes that we have committed ! We are accused to what lengths will not calumny transport the heart ! we are accused of eating your chickens while they are still young, of making depredations from time to time upon your pigeons, of watching your canary-birds incessantly, and seizing any that come near enough to the lattice of your aviary, and of suffering the mice to infest your house unmolested. But are imputed crimes sufficient to render any one guilty ? These horrible accusations we can easily repel. In the first place, it must be observed, that they do not rest upon any proofs. Granted that the feet of some pigeons, or the feathers of some chickens may be produced ; can these be admitted as evidence before any tribunal upon earth ? Great crimes are, besides, the consequences of great misery and want, and we receive every day from you, to the number of eighteen cats of which our troop consists, abundant means of subsistence ; nothing is wanting to us. And can we be supposed to scratch the hand by which we are nourished ? Have you not, more than once, with your own eyes seen your chickens come and eat off the same dish with us, without the least hostile movement on our part. And if you are told, that we never eat the chickens when conscious that we are observed, that it is by night our murders are committed, we answer, that it is our calumniators who hide themselves under the veil of darkness to frame their cruel plots against us. This we may the rather say, since they are reduced to impute to us nocturnal crimes, which are contradicted by our conduct throughout the day. But, say our enemies, the poultry-yard of our most illustrious lady is maintained at an expense of twenty-five louis annually, while of two or three hundred chickens reared there, she never eats more than fifty ; so that, from her great economy, they cost her only twelve livres each : what then becomes of the rest? We will ask, in the first place, were the chickens numbered and consigned to our care, and are we answerable for them ? Surrounded by so many destructive beings, by mankind in particular, who are firmly persuaded that chickens were only created to be eaten by them, is it on us that the first suspicion can with justice fall? Every Sunday at the gate of the Wood of Boulogne, and in the public-houses of Auteuil, a hundred fricassees are served up ; is it not probable that some of your chickens may have glided gently in among them ? and certainly it is not by us that they are remitted to the innkeepers. After all, madam, without wishing to become the apologists of chicken-stealers, let us be permitted to observe, that whatever may be the causes which occasion the diminution complained of in your stock of poultry, they are in the order of nature, and produce a salutary effect to yourself, since they restrain within due bounds the multiplication of this species, which, if suffered to go on unrestrained, would soon convert your whole house into a receptacle for chickens, and reduce you to going without a shift, that no limits may be placed to the number of your fowls. And so to the missing pigeons....we meet a particular favourite by name. As to the pigeons, it must be allowed that several of the children of Coco (“A favorite tame pigeon of Madame Helvetius, to which she had given that name”) have disappeared ; but you must not permit your tenderness for him, which goes so far as to suffer him to break your china, provided he will condescend to eat out of your hand, to render you unjust towards us. Where is the proof that we have ever eaten any of his children ? or do we and his species ever approach each other ? Always keeping upon the roofs of the houses at a distance from us, do they not manifest a distrust of us at which we have just reason to be offended. Let the whole wood-yard be examined next spring, and if any traces of murder be discovered, we will be among the most forward in endeavoring to detect the malefactors, and give them up to justice. But the pigeons are not like us poor humble cats, confined to the soil where we were born ; they can fly in the air to another country : those whom you miss, jealous no doubt of the preference shown by you to some over the rest, have taken their flight in search of equality to some republican dove-cote, rather than drag on a painful existence under the insolent tyranny of your favorite Coco. The accusation brought against us with regard to the canary-birds, you must see yourself is wholly absurd, and a gross imposture. The intervals in the lattice of your aviary are so narrow, that when sometimes we have in sport endeavored to thrust a paw through them, it was not without the utmost difficulty that we could withdraw it again. It is true, that we sometimes amuse ourselves with watching the little innocent sports of these pretty creatures, but we cannot reproach ourselves with having ever shed a drop of their blood. As to the nightingales, the cats, in enlightened fashion, plead invincible ignorance - with a nice satire on 18th-century musical controversies. We know that we are also accused of eating nightingales, who never plunder, and sing, as they say, most enchantingly. It is indeed possible that we may now and then have gratified our palates with a delicious morsel in this way, but we can assure you that it was in utter ignorance of your affection for the species ; and that, resembling sparrows in their plumage, we, who make no pretensions to being connoisseurs in music, could not distinguish the song of the one from that of the other, and therefore supposed ourselves regaling only on sparrows. A cat belonging to M. Piccini (“An Italian composer”) has assured us, that they who only know how to mew, cannot be any judges of the art of singing ; and on this we rest for our justification. However, we will henceforward exert our utmost endeavors to distinguish the Gluckists (“The admirers of Gluck, a German composer"), who are, as we are informed, the sparrows, from the Piccinists, who are the nightingales. We only entreat of you to pardon the inadvertence into which we may possibly fall, if, in roving after nests, we may sometimes fall upon a brood of Piccinists, who, being then destitute of plumage, and not having learnt to sing, will have no mark by which to distinguish them. complaining of the ravages made by these birds among the cherries and other fruit. The Sieur Abbé Morellet, in particular, is always thundering the most violent anathemas against the black birds and thrushes, for plundering your vines, which they do with as little mercy as he himself. To us, however, most illustrious lady, it appears, that the grapes may just as well be eaten by blackbirds as by Abbés, and that our warfare against the winged plunderers will be fruitless, if you encourage other biped and featherless pilferers, who make ten times more havoc. 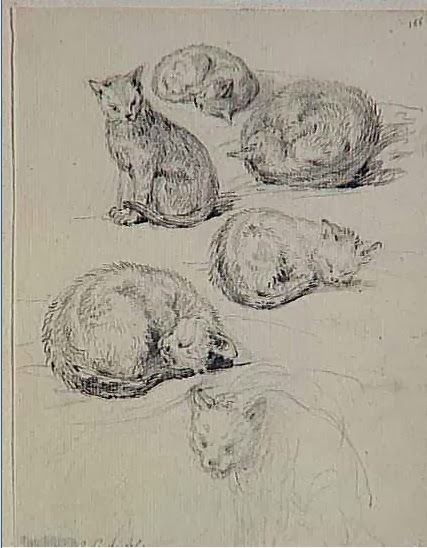 Augustin de Saint-Aubin, Sketches of cats, 1780s. The cats are accused of letting the mice proliferate to the extent that they steal sweetmeats and eat holes in the books. The last imputation we are called upon to repel, most illustrious lady, is that of suffering your house to be infested with such a quantity of mice. They make terrible havoc, it is said, with your sugar and sweetmeats ; they gnaw the books of your savans, and even nibble the slippers of Mademoiselle Luillier (“An old waiting-maid of Madame Helvetius) as she is walking. It is urged, that cats being created by Providence, (who watches with equal goodness over all his creatures) for no other purpose but to eat mice, deserve nothing better, when they fail in the object of their vocation, but to be drowned. But maybe there are culprits other than the mice to blame - here is an opportunity for Morellet to tease Cabanis who obviously had a sweet tooth. As to the nibbled books, they are not much use; Morellet has the cats sing the praises of Madame's natural virtue which has no need of intellectual accomplishment. With regard to the books of the Abbé de la Roche and that other savant(“The Abbe Morellet”) whose speech at the Academy we just now read as it wrapped up a calf's lights which you had the goodness to give us ; with regard to their books, we ask, where is the great harm if they are sometimes gnawed a little by the mice ? Of what use to them is all their reading? Since they have lived with you, must they not be fully convinced of the iuutility of all knowledge ? They see you good without the assistance of Treatises upon Morals; charming in your manners without having read our historiographer Moncrief's Art of Pleasing ; and happy without being acquainted with the Treatise on Happiness, by the unfortunate Maupertuis. While they are the daily witnesses of your profound ignorance, they, who know so many things, are wholly unacquainted with the art you know so well of being able to dispense with knowing any thing. Your orthography is not much better than ours, and your writing is very like the scratching of a cat's paw. You totally mistake the way to spell happiness, but you enjoy the thing without knowing how it should be written ; that happiness, in short, which they cannot draw from their books, you shed around them from the eminence of your ignorance. The mice cannot, therefore, as we have proved, do them any great injury. As to the slippers of Mademoiselle Luillier, if she would only creep on at a somewhat less drawling pace, the mice would not be able to get at them ; and it is strange that you would condemn us to death because your waiting-maid moves only a snail's pace. The cats now complain that, since the death of Pompon, they are persecuted by new favourites, who are not only unpleasantly canine, but English to boot! But these reasons, strong as they are, are not the only ones which may excuse us towards you for the spoliations committed in your house by the mice. Ah ! most illustrious lady, with what conscience can we be reproached for not catching them, when you have constantly about you two large dogs thirsting for our blood, who will not permit us to approach your beloved person, as duty and gratitude would lead us to do ? Two dogs ! this is saying enough: they are animals brought up in the utmost hatred of our species ; their barking always fills us with terror. How can any one be so unjust as to reproach us with keeping at a distance from places where animals thus ferocious, whom nature has inspired with such aversion to us, and such power to destroy us, reign uncontrolled ? Nay, farther, if the question were only of French dogs, there might be hopes that their hatred Would not be so active, that their ferocity would not be so alarming ; but you must needs take into your service (in contempt of the wise decrees of the comptroller-general) a bull-dog which you have imported from England, who hates us doubly ; in the first place, as cats, and still more ardently French cats. We see daily before our eyes, the cruel effects of his rage in the shortened tail of our brother Le Noir. Our zeal to serve you, united with the natural taste we have for mice, would lead us to form hunting-parties in your apartments, if we were not banished by these formidable enemies whom you have made masters of them. Let us no longer, therefore, be reproached with the disorders committed against you by the mice, since we are deprived of the possibility of repressing them. Alas ! those happy times are no more, when that illustrious cat Pompon reigned in these places, slept on your lap, and reposed upon your couch ! when that Zemira, who now so eagerly endeavors to procure our downfall, humbly paid his court to the favorite whose situation he now occupies. Then could we parade about the house with our tails in the air : the late M. Pompon would sometimes condescend to share with us the rabbits graciously sent him by his majesty from his shooting-parties ; and under the protection of this illustrious favorite we enjoyed peace and happiness. Those happy times, we must repeat, are, alas ! no more : we live under the reign of a DOG : sunk in deep and lasting regrets for the CAT, beneath whose empire such enjoyments were ours, while our only consolation is to go every night, and water with our tears the cypress which shadows his tomb ! Memoirs of the Baroness d'Oberkirch, p.152-3.